Sunny Appliance repair was opened in 2011, at first only in Fremont, Hayward, Newark and Union city. We have proven to be successful very fast because of good prices, fast and qualified service and polite technicians. At this moment we cover many cities in Bay Area including Fremont, Union City, Newark, Hayward, San Leandro, Alameda, Oakland, Berkeley, Richmond, San Francisco, Sausalito, San Mateo, San Carlos, Palo Alto, Redwood City, Mountain View, Sunnyvale, Milpitas, Santa Clara, San Jose, Los Gatos, Morgan Hill, Pleasanton, Livermore, San Ramon, Danville, Walnut Creek, Dublin, and others. At the Sunny Appliance Repair we understand how frustrating it can be when one of your appliances goes out of order, whether it is a leaking refrigerator, broken restaurant oven, AC (furnace) that won't blow cold (hot) air, or a dryer that doesn’t dry as well as you’d like it to. You don’t have to cancel your plans or sacrifice your activities in order to shop for a new appliance and install it or wait and wait until someone comes and fixes it. Appliances and HVAC aren’t rocket science after all! At the Same Day Appliance Repair we thrive to make this experience as painless and quick for you as possible. Our technicians arrive at your doorstep the same day you called and at the time convenient for YOU. So you don’t have to wait for hours and hours and miss important events in you live! All of our technicians are licensed, insured and trained by professionals. We provide quality appliance repair and installation in many cities in the Bay Area. We also do AC and Heater (HVAC) repair. When you call Sunny Appliance Repair you can always count on affordable prices and experienced technicians who definitely will help you with washer and dryer repair, refrigerator repair, microwave, oven and stove repair, heater, furnace and AC repair, as well as built-in appliances repair. 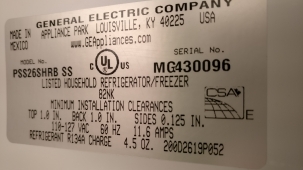 The service call fee is $85 for the residential appliances and HVAC, or $95 for the commercial appliances and HVAC. However, if you choose to repair with us, service call will be absolutely FREE. You can schedule same day appointment with no-additional charge! The price for appliance parts and labor will be the lowest you will find! Your feedback would be greatly appreciated. If you liked our sevice, please review us on Yelp. If you weren't satisfied with the quality of service, you may call us and we will review your complaint.